No website, no Facebook “likes” or notifications, no email, no slick 4-color postcard, no itinerary. If anyone there had a cellphone, it probably didn’t work that far from he city, and it sure didn’t have Google Maps or Twitter, or even text messages. I left the house on my barely-running 24-year-old Vespa with no spares, $50 in cash, a tent, a change of clothes, and only an asterisk on a vague map to get me there. It was all going to be fine, Alfredo was with me. I’d talked to Kristen on the phone, she sounded alright. Worst case, I’d… well, better not to think about that. This dumb flyer was enough to convince me and probably about 100 more people to show up in the middle of nowhere. 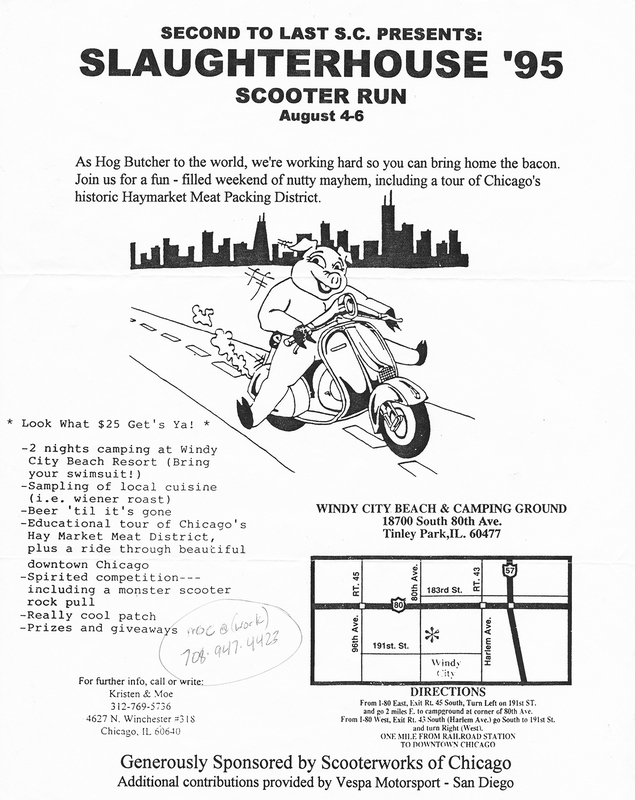 I met people from all over the Midwest, even a few from the East Coast and Canada, who’d learned about it from phone calls and club newsletters and word-of-mouth and tiny local scooter shops. 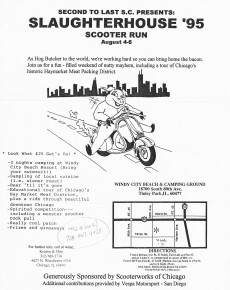 People brought actual photo albums to share their photos from past rallies, and dogeared copies of Scootering magazine from England, to brag that they got a couple photos and a paragraph written up there. Looking at the flyer now, it’s surprising it says “Second to Last SC,” I didn’t think the club had a name yet at that point. The vague list of events didn’t really go down as planned. The campground, despite being across the road from a metal band (Metallica, maybe?) playing an outdoor show at World Music Center, shut down the DJs at 10:00. I did bring my swimsuit, and I might have been the only person who dared to step in their “lake.” I don’t remember a rock pull or any games. The “Educational Tour” consisted of a grueling ride halfway back downtown until so many people broke down, we turned around and came back. I remember Brent and Jon both rode down from Milwaukee, and both snapped their P200 shock mounts on the same pothole. They could have used an iPhone right then. But we had fun, and lots of it. There was beer, and hot dogs, and music (until 10pm), and I met a bunch of lifelong friends who kept me abreast of other scooter rallies. And I planned one myself later that year, And the next year, I helped plan Slaughterhouse II. On the surface, II was kind of a debacle, the campsite flooded and only 15 people showed up, but it was one of my favorite rallies ever. I still talk to most of those 15 people regularly, and see them at rallies a couple times a year. I’ve been to every Slaughterhouse since, and they’ve all been great. Last year, for the 20th anniversary, we found a perfect campsite/bar out near Starved Rock and we’re going back there this year, The website and Facebook page are a bit short on details at the moment, but it’s going to be great. Our baby is 21. Old enough to drink, and it shouldn’t take anything more than the promise of beer, hot dogs, and an embroidered patch to get you jerks to come out and party. Hope to see you there. Next Next post: Slaughterhouse 21 Comin’ Up!